The percentages of ESP spam in the traps were, respectively, 3.0%, 3.4%, 3.0% and 2.8% during this period. Ediware disappeared back into the void it had come from after the Oct 24 disaster. All other operations on the list are household names. 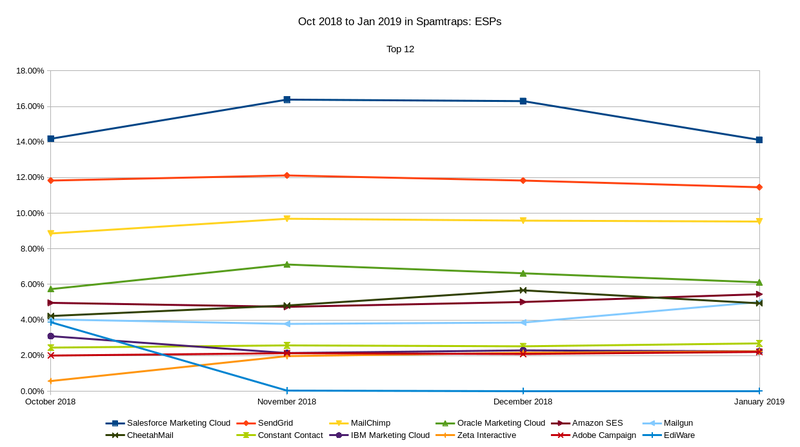 Salesforce keep increasing their lead over the competition. I am pleased to see that SendGrid made Advisor Perspectives disappear after the very beginning of November. Nobody could guess what explains the simultaneous rise in Zeta Interactive’s spam output, from relative obscurity (#28 in October) to #11 in November and the Top Ten in December-January. Looking forward to seeing you all in San Francisco in a few weeks!